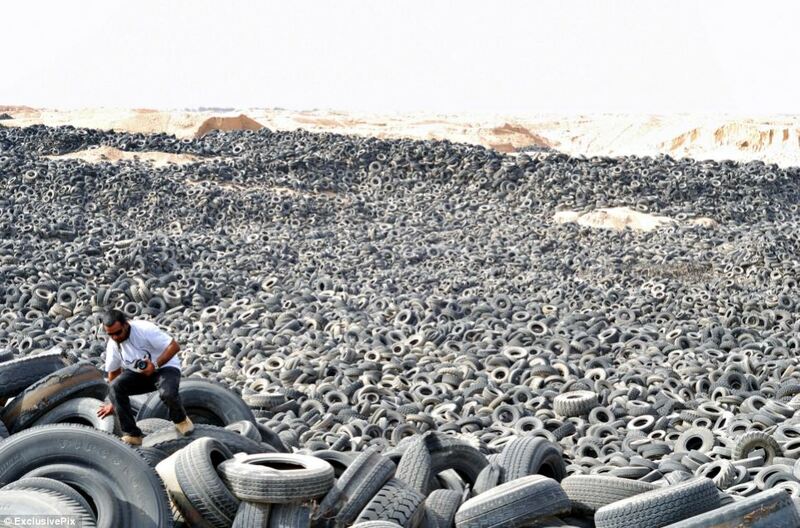 An average car tyre will travel around 20,000 miles over its lifetime, but when they have reached the end of their life in Kuwait... they are destined for the tyre graveyard. 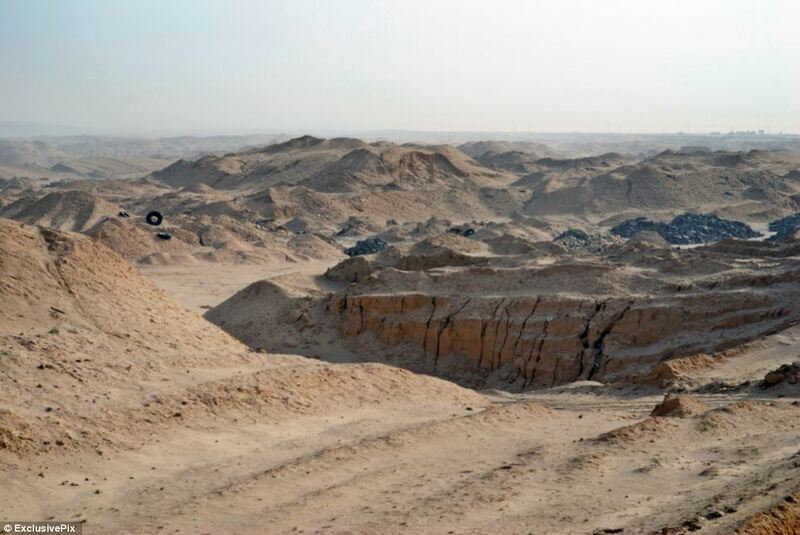 In Kuwait City's Sulaibiya area every year gigantic holes are dug out out in the sandy earth and filled with old tyres - there are now over seven million in the ground. The expanse of rubber is so vast that the sizable indents on the earth are now visible from space. 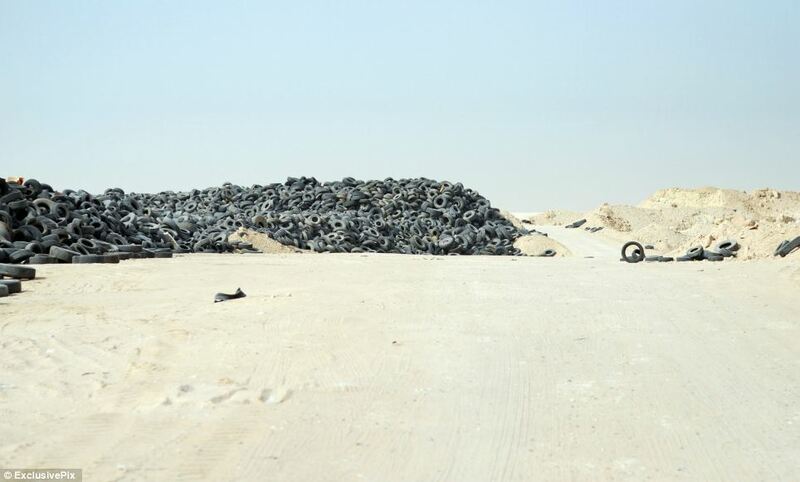 It is thought the tyres are from both Kuwait and other countries which have paid for them to be taken away - four companies are in charge of the disposal and are thought to make a substantial amount from the disposal fees. 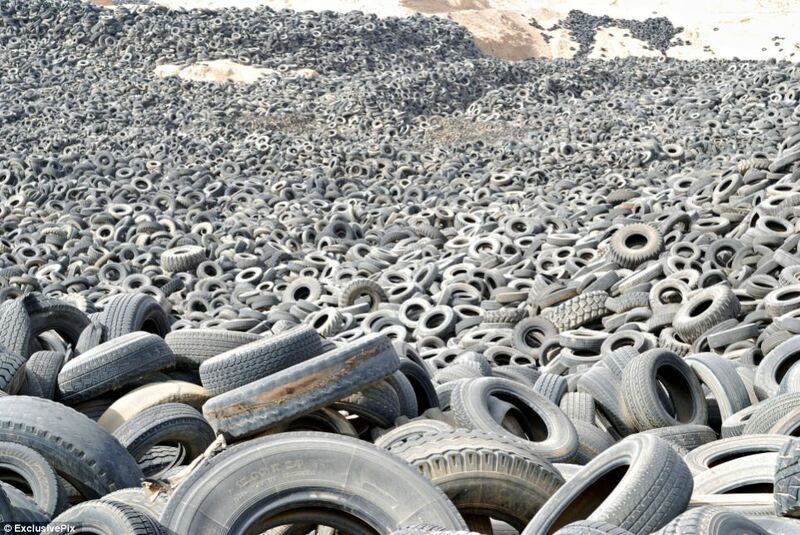 In Britain all car and truck tyres must be recovered, recycled and reused. Currently, more than 80 per cent of the 55 million used tyres generated in Britain are processed via the Responsible Recycler Scheme. The scheme ensures full traceability and accountability of waste tyres throughout the disposal chain, from collection through to their final reuse in an environmentally friendly or acceptable method. Materials from properly recycled tyres are used for a variety of uses including a children’s playground, running tracks, artificial sports pitches, fuel for cement kilns, carpet underlay, equestrian arenas and flooring. 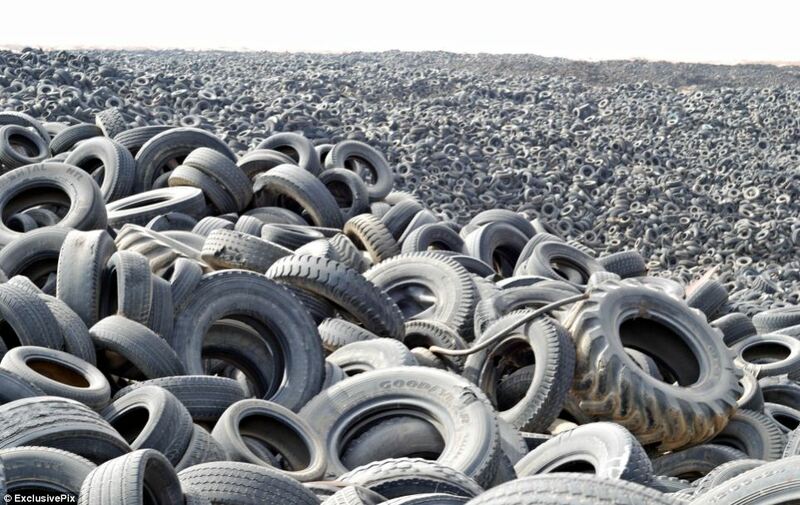 Bales of tyres can be used in the construction of modern engineered landfill sites and flood defences. 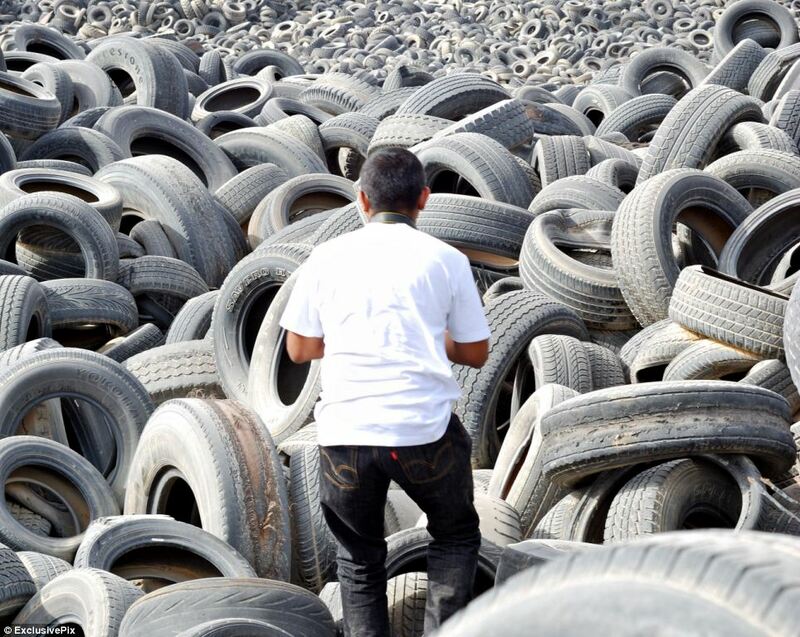 If waste tyres are in good condition, they can be re-moulded and put back on the road as ‘re-treads’. 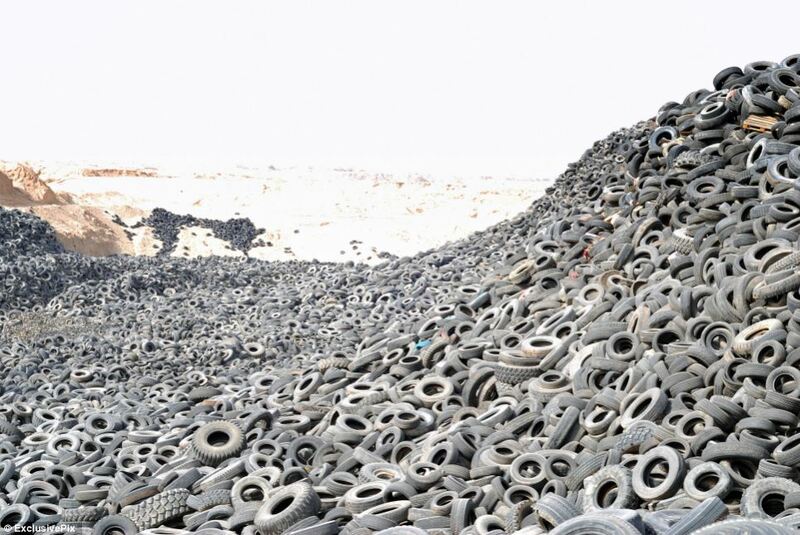 In 2010, just over 30 per cent of waste tyres were turned into crumb, 18 per cent were used in energy recovery, nearly 20 per cent were re-used (in the UK or abroad), 16 per cent were specifically used in landfill engineering and 11 per cent were re-treaded, according to the Environment Agency. In some circumstances tyres are shipped out to countries such as India, Pakistan and Malaysia, but there are strict laws about their exportation. Last month it emerged that recycled car tyres could soon be used to surface roads across the country after a pioneering trial found they made roads quieter. One of the busiest roads in Scotland was resurfaced last year with the asphalt, containing shredded rubber from old tyres. Tests were performed on grip and skid resistance, with engineers reporting that the rubber road, on a stretch of dual carriageway between Perth and Dundee, resulted in a quieter drive. Experts claim the road requires less maintenance and still allows for drainage, while tyre recyclers claim the technique will also save money because the new material is thinner than standard roads. Rubber roads were first built in the 1960s in the US, where today there are 20,000 miles of road made of recycled tyres. Rubber roads are also popular in China, Brazil, Spain and Germany. The technique has been found to cut traffic noise by about 25 per cent. The asphalt is made by breaking down used tyres into rubber ‘crumbs’ which are added to bitumen and crushed stone, which are typically used to make asphalt. 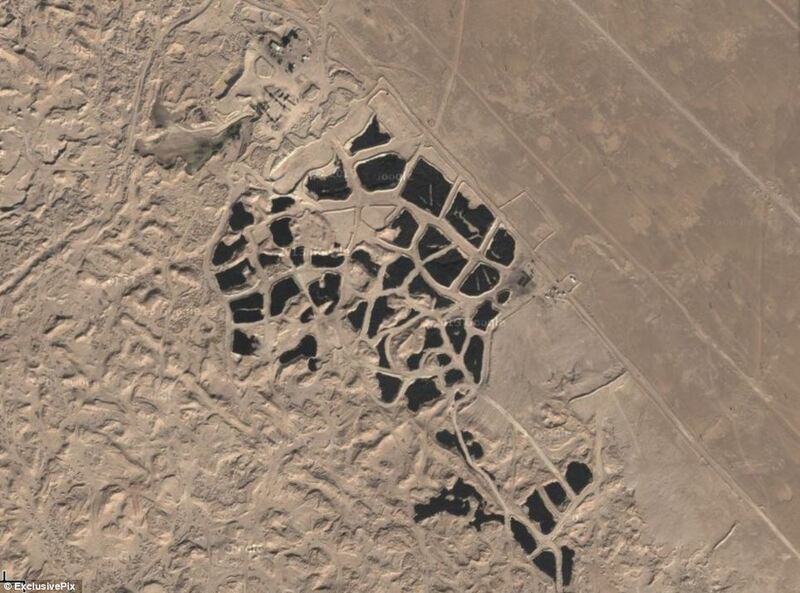 Last year a fire broke out in a Kuwait tyre dump which was so big that it could be seen from space. The fire broke out on April 17 at a tire dump near Al Jahrah. It is believed that around five million tires fuelled the fire which specialists struggled to control. Hundreds of firefighters as well as soldiers and employees of the Kuwait Oil Company took part in the efforts to extinguish the blaze. A number of MPs described the fire as an 'environmental catastrophe' and vowed to demand a debate on the issue in a special parliamentary session Some said they will demand an official probe. A month later another fire broke out at an Amghara scrapyard and firefighters from six stations were drafted into help. Tyre fires are difficult to extinguish - they produce a lot of smoke, which often carries toxic chemicals from the breakdown of rubber compounds while burning. Geez Louise that's a whole lot of tires!!!!!!! Is it possible to get close to it? I would love to go there and take some pictures.